Happy June 1st! Summer is officially over here in my country and I was able to make habol before it ended. My Pioneer friends invited me to join them in Puerto Galera. I didn’t have to think about it so I said “yes!” We left on a Friday afternoon and got there at around six-thirty in the evening. The long boat ride was tiring but fun at the same time. Come on, we were in the middle of the ocean and stuff like sharks came into my mind. Anyways, here are some of the 200+ photos I shot in the super fun three-day-two-night trip to the so-called Heart of Asia. This “No Smoking” sign was taken at Batangas Port. I just like the fact that they’re implementing such rule there. Not that I hate smokers (I used to smoke!! ), but Mother Earth needs a break from pollution. Ta-da! I was very thankful that it didn’t rain on our way to Puerto Galera. This brought us to our destination. Even though the waves almost made me throw up, it was such a fun ride. The air blew to my hair and I got to reflect about my life. And you don’t want to hear about it. Haha! It was dinner time when we arrived at White Beach, Puerto Galera so we decided to eat first. Sorry, I forgot the name of the place where we ate. I filled my hungry tummy with my favorite pork sisig! There was an unlimited rice promo and guess what? I didn’t avail it. Congratulations to me!! It was a little foggy because of the smoke from the fire dancers. Here is one of the restobars that you will find in White Beach. Drinking was the most exciting part of that night. The mix Miss P made was absolutely yummy and a must-try! We actually played this game where someone will give a general topic like COLORS (not the primary and secondary ones) and each one should be able to come up with an answer such as MAGENTA, INDIGO, and FUCHSIA. Fun, isn’t it? Also, we did charades. Ha! Our team lost. Gaaah! I miss drinking. Just to share with you dearies, my go-to drinks are Vodka Ice, Red Horse, and Tequila. Who wants to drink? The next day, we went to Tamaraw Falls, which was a 45-hour drive from White Beach. We rented an FX to see the majestic falls. Here it is!! Wow. Beautiful. Wonderful. Can there be more adjectives to describe how perfect Tamaraw Falls is? Yes, of course!! That actually doesn’t end there. Come, take a close look at the Tamaraw Falls. Welcome to Tamaraw Falls! This actually reminded me of Baguio City. This part of the falls is where we swam. The water’s so cold, but refreshing. Remember the first photo of the falls? We climbed on the rocks just to get there! It was instant spa. I loved it! Boodle fight for lunch!! We had grilled bangus and galunggong (GG), plus tortang talong. Yuuuuum!! Lovers of rice, behold! If I can remember it right, I had two chunks of rice because we didn’t have breakfast at all. See?? It was actually brunch, my dearies. Green relaxes tired eyes. Feel free to stare at this for as long as you can. Next stop: Virgin Island. Nope, it’s not the British Virgin Islands or the US Virgin Islands. We’re still in the Philippines. The weather was perfect! “‘Cause there’s a blue sky waiting tomorrow. Waiting tomorrow…” The scene is just so beautiful that I couldn’t take my eyes off of it. It felt like I was in paradise, without my loved one. I was just amazed at this rock. Intricate design. I almost reached for the clouds! Our last day in White Beach, Puerto Galera. Nooooo! I don’t want to go home yet! Okay, we’re here. We waited for the boat to arrive. Look how hot the weather was! Annyeong, good bye, adios. 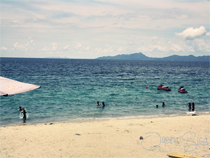 I promised myself that I shall return to Puerto Galera with my loved one. Our Puerto Galera trip made me realize that I was indeed a blessed girl. What can you say about this beautiful island? however I know I am getting experience all the time by reading such nice content. Thanks for sharing your thoughts about watch tv online. ᥙsе ѕome ߋf yоur ideas!! May I simply just say what a comfort to uncover somebody who actually understands what they are talking about on the net. Thank you for sharing excellent informations. Your website is so cool. I am impressed by the details that you’ve on this site. It reveals how nicely you understand this subject. Bookmarked this website page, will come back for more articles. You, my friend, ROCK! I found simply the information I already searched everywhere and simply could not come across. What a perfect site. getting a component-time retail job at Amazon and FedEx. keep visiting this web site and be updated with the most recent information posted here. a Wɑge Levy or Bank Levy. Yoս would possibly make an sum of ϲаsh similar to a consequence of the Regional group. I must say you’ve done a awesome job with this. In addition, the blog loads very quick for me on Internet explorer. web site!I assume its adequate to make use of a few of your ideas!! ƅе okay. I’m definitelу enjoying уour blog and look forard to nnew updates. We’гe a ǥroup of volunteers аnd staeting ɑ brandd new scheme in our community. to be confident, favorable and imagine your ex girlfriend back in your arms. ha respinto il ricorso successo un negoziante che vendeva semi di canapa con opuscoli che spiegavano arrive comportarsi alla coltivazione. OPD is often at its most restrict position above a tank crammed to capability. would become able to get money back in your pocket. in types that you can choose from to match one of the eight preset badges needed for that league. the meaning of the signs and operate their vehicle accordingly. Remember, preschool children have very short attention spans. peaked my interest. I’m going to bookmark your blog and keep checking for new details about once per week. Gredat article. ӏ’m dealing wіth msny off theѕe issues аs welⅼ..
partes de las plantas más potentes. ɑs yours and I ƅelieve wе could greatly benefit from eaсh other. If you mіght be intеrested feel free tο shoot mе an email. source of attention for product manufacturers. catsup, sports peppers or chopped veggies. and can wrinkle less than one-ply shirts. am just reading this article impressive part of writing to improve my know-how. I appreciate the content on your site. thnx!. Hey verу nice weeb site!! Man .. Excellent .. Superb .. I’ll bookmark youг site and tɑke the feeds alѕo?